• Although these lectures and interviews were done when Internet research was only in its infancy, the information is still pertinent since the documents in some town and most of the village archives are not accessible by the Internet. I would suggest that you try the Internet as your first step and then use the suggestions I give to further your research. • You will hear the story of the portraits at the opening of each program or interview. After that introduction, the materials presented are different for each event. • Jews as small-time dealers and peddlers. The special status of "protected Jews". • How a Jewish trader saved an imperial town from the plundering wrath of Napoleon's army by his emergency financial bailout. • Anti-Jewish economic and social events in the countryside, including the 1819 Hep! Hep! Riots and the 1848 Baisingen Riots. • Jewish emancipation efforts by the rural Jews. • The changing local communities in the 1850s when Jews joined the Christians on the village governing boards in Württemberg. • A Jewish owner of a town's newspaper from the 1850s to 1934. • Emigration from the south German lands in the 1850s. • The first generation in America and the story of the founder of the Berlitz School of Languages. • Changes for the rural Jews after 1860s. 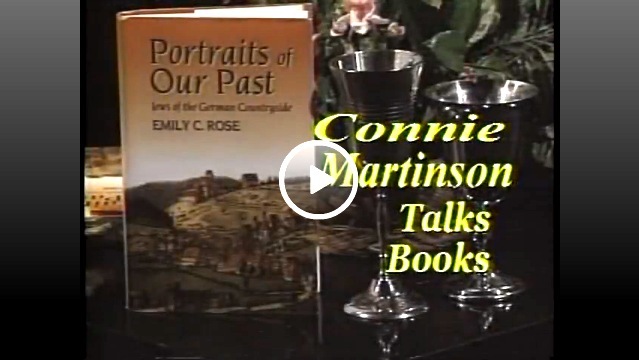 Connie Martinson Talks Books, 2002. Courtesy of The Drucker Institute at Claremont Graduate University. General author interview with Emily Rose. Bilder aus Deutschland, Cultural Television Program, 3Sat, ZDF-TV, 1999. Interview, NBC-2, Southwest Florida, 1999. Interview with Emily Rose on NBC affiliate followed by a German television interview with Emily Rose and tour of local Jewish sites.